Aside from reliable soul contact what do you suppose to be the most reliable step to use as a foundation to the search for truth? I think a good indicator is whether or not the teaching conflicts with truths that have been previously established. If they do conflict, it is a good hint that they are based on deception and/or illusion. Truth is eternal and a genuine teaching reveals or expands on it rather than contradicts that which is already accepted. This is a good description of the first rule of discovery. Let me word it this way. Take the things you know (for reasonable surety) to be true and use them as a foundation or stepping stones for testing additional truths. This is a principle that is available to all. It does not take a high spiritual evolution, soul contact or any supernatural powers. Let us take basic mathematics for example. If 1+1=2 and 2+2=4 and you have tried and tested this formula then you can be reasonably sure that these additions will be correct in any other use where they are applied. If you then come across a teacher who has a formula wherein 2+2=5 you may be reasonably sure that a mistake lies therein. If the teacher and the class accuse you of being narrow minded for your lack of belief you should still stand your ground. Make them show you the logic behind the reason that 2+2=5 in their mind. Be open to all possibilities, but remember this. When your foundation truths are challenged the chances are that the challenger is presenting illusion and you should question accordingly. Question: Even though your foundation beliefs are great stepping stones there does come a time when you will discover that some of them are either not true or founded upon partial truth. What makes this discovery possible? Amazingly Rick and Paul are on the same page on one point – that is in the idea that truth brings a feeling of joy and peace or tranquility. This is certainly true if it is the discovery of a truth that we “seek” as Christ admonished us to do. When we seek and find there is indeed joy. However, truth can also bring fear and terror. Consider the person who discovers the “truth” about his spouse’s affair. Consider the person who discovers the “truth” about a large financial loss. Consider the person who discovers that he has been traveling the path of illusion for forty years and now must backtrack and start from square one. This truth will make his heart sink. There are many truths beyond our ring-pass-not that we are unprepared for and would be devastating for us to prematurely learn. Nevertheless, most of us on this list are truly seeking our next level of truth and there is indeed joy in discovery when we are ready and seeking. It is important to realize though that there are many who are happy with the level of truth they have attained and if someone presents to them a greater light than they are ready for it will be a painful experience for them and they will often fight against it. The key for the teachers of this age is to present truth in such a way that gently works it way into the consciousness of the students. This is one thing I tried to do when writing Book One of the Immortal. I tried to avoid writing about anything that would attack anyone’s belief system whether they be new age or standard Christian. I will say this – that even though some truths may be painful for us to accept that when it is accepted there is a certain peace associated with it. Even when the dying patient learns he is going to die the acceptance of such is peaceful. The true seeker will never exchange truth for illusion no matter how disturbing. Rick was correct in this sense. There are times when you are faced with a choice between the real and the unreal, what is true and what is false. When faced with such a choice and within your heart you seek the truth, in this case there will be a sense of peace surrounding the truth and fear connected with the false. Even so, it may take a great deal of courage to chose the truth. For instance the hell fire and brimstone people may tell you that if they are right and you are wrong and you do not accept their way of salvation you will burn in hell forever. The temptation fear presents is: Why take a chance? Play it safe and go with us. To break free from false religion you have to be sure enough of the truth of the love of God that you feel that you are not risking eternal damnation. I have taught a number of people who are under the threat of damnation from their religion, and generated interest in escape, but most of them fall back on the safety of their church to protect them from the evils of hell fire. Sad. 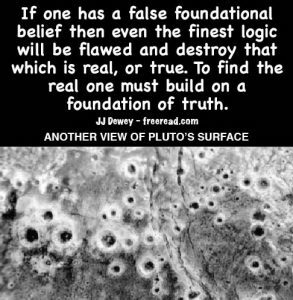 Even though your foundation beliefs are great stepping stones there does come a time when you will discover that some of them are either not true or founded upon partial truth. What makes this discovery possible? What are some common erroneous foundation beliefs that we see about us? I could really relate to this as it has happened several times to me in my life. It can be very troubling when a foundation belief is disturbed, but then when the barriers are let down there is great joy when higher truth is accepted. “We” have a corner on the truth. “We” have it and you don’t. You only have one shot at life, you better do it right. Evil is more powerful than good. I’m not responsible…..for what happens to me, for what kind of leaders are leading, for the ills of this world etc. etc. It’s so screwed up there is no hope. Good points here. Some would say that the truth is that good and evil are equal, but such is not so. Good is the dominate of the two and this is the reason that our progression moves forward as an eternal spiral. If good and evil were exactly equal then we would be going in circles for eternity. A law “Dominating Good” lies behind all that God has made. That thought registers well with the soul. Rick mentions a foundation belief of a black and white view of the Bible. This indeed turns into a mindset that can blind people to higher truth. Actually, this is more the fault of a false teacher than it is the Bible itself.